I've been trying to make the Coelophysis by Satoshi Kamiya, on step 44 it says to 'fold the angle trisectors' - but how do i do it? 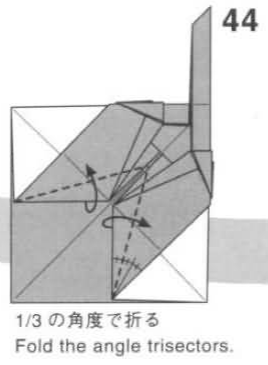 I tried googling on how to trisect an angle but i dind't find anything that i could implement here, i also searched on the forums but all i could find is trisecting a 90 degree angle. It’s best to simply eyeball the angle in this case. alternatively, just use a protractor. with this model, it's relatively easy to "eyeball" the angle, but with other models it gets hard. when you get old like me, you'll find purity is overrated. use rulers and protractors. if precreasing has a busy grid, mark references with a pencil somewhere inconspicuous.